Introducing the all new Weber Genesis II LX gas grills featuring the new GS4 system which includes an Infinity ignition, revolutionary stainless steel high performance burners, new Flavorizer bars with flame view window and a Grease Management System. The porcelain-enameled Weber Genesis II LX E-240 features two (2) stainless steel high burners with High heat setting that produce 29,000 BTUs of power and a 12,000 BTU side burner. 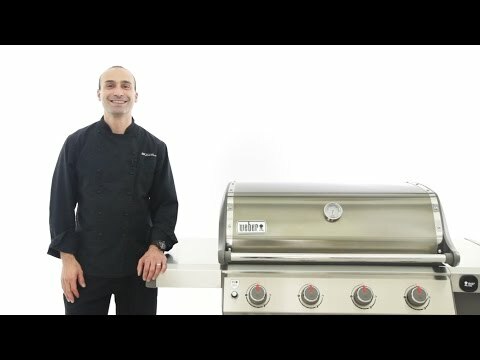 The Genesis II LX E series gas grills come fully equipped with 7mm stainless steel cooking grates, stainless steel Flavorizer bars and stainless steel heat deflectors to effectively hold and distribute heat evenly over the 380 square-inches of cooking grates. The Tuck-Away, Elevations compatible warming rack provides an additional 114 square-inches for a generous 494 square-inches of total cooking area. The Genesis II LX grills come equipped with a Grease Management System that makes clean-up as easy as possible. The porcelain-enameled hood has a center-mounted thermometer to monitor cooking temperatures and has painted cast-aluminum end caps. 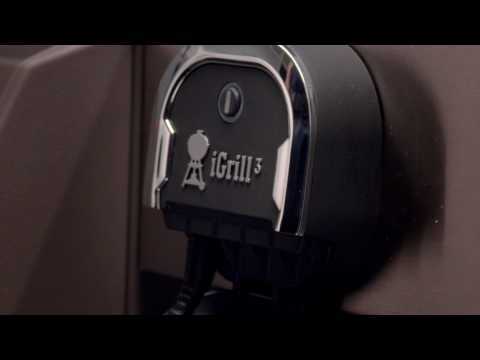 The Genesis II LX E series grills are iGrill 3 ready, have lighted control knobs, a handle light and features an LED fuel gauge on propane gas models. The welded tube frame with enclosed cabinet includes two (2) shelves inside the cabinet for storage and two (2) side shelves, providing much needed prep space with the left side shelf folding down for compact storage and two (2) heavy-duty locking casters and two (2) large wheels. The grill is mostly pre-assembled, allowing you to start grilling right away. The propane tank is stored to the side, freeing up the shelf space under the grill and has a tank shield that keeps the tank out of view. Three (3) convenient built-in tool hooks keep your BBQ tools nearby. 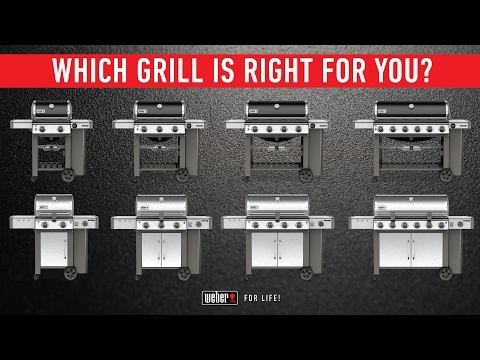 Cooking Grid Dimensions 19 X 19"
Weber Genesis II gas grills are covered by a limited manufacturer warranty against defects in material & workmanship for a period of 10-years from the original date of purchase. Warranty excludes normal wear and is limited to the original purchaser. The Weber Genesis II LX gas grill offers several upgraded features not found on the Genesis II. The Genesis II LX comes in your choice of stainless steel or black finish and is available in a 2,3,4 or 6 burner model. Like the Genesis II Special Edition, the LX includes stainless steel Flavorizer bars and 7mm stainless steel cooking grates. The cooking grates are designed with notches cut out towards the front, allowing you to easily see whether each burner is lit. The Genesis II LX is offers the highest heat output of the Genesis II line, featuring high performance stainless steel burners that produce approximately 14,500 BTUs per burner. The burners are lit by Weber's reliable push-and-turn electronic ignition and are designed to taper towards the back of the grill. 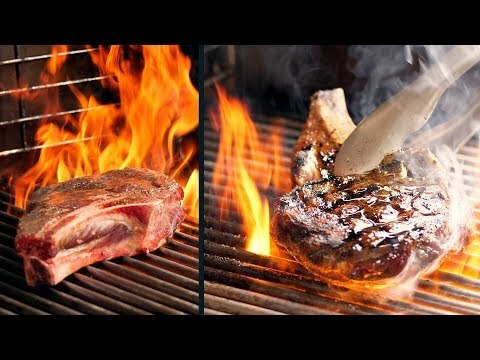 Since most grills tend to cook hotter towards the back, these burners reduce the heat on the back side of the grill, producing more consistent temperatures across the cooking surface. The LX includes a 12,000 BTU side burner, giving you more cooking versatility. The side burner features a cover, which gives you valuable side shelf space when not in use. The Genesis II LX LX also features an enclosed cart with double doors, allowing you to store items safely from the elements. Also, the LX features lighted control knobs and a handy handle light for nighttime grilling. Like the other Genesis II propane models, the LX saves you valuable storage space with its propane tank storage area, located under the right side burner This area conveniently allows you to connect and mount your propane tank underneath the side burner. The LX features an easy-to-read LED fuel gauge to monitor your fuel levels while cooking. The tried and true Weber Cooking System is great at providing even heat distribution and minimizing flare ups. Within the durable cast aluminum housing, are the triangular-shaped stainless steel Flavorizer Bars that sit directly above the burners. They shield the burners by catching drippings and turning them to smoke, adding flavor back into your food. Weber pioneered the Flavorizer Bar in 1984, and since then they've proven to do their job extremely well, which is why they're still preventing flare-ups on all Weber gas grills today! Weber customer service is as good as it gets, with over 50 years of experience. Weber offers a 10 year warranty on the grill body and stainless steel parts parts, such as the cooking grids, burners, and flame tamers. Weber is known for amazing customer service and will quickly handle any service or replacement part situations. While the Genesis II LX offers a stainless steel model, the grill is not made entirely of stainless steel like other gas grills in this price range. You want a feature packed grill, offered by Weber, the biggest name in BBQ. How difficult is the assembly? Nana, the assembly is not difficult at all and there are detailed instructions in the manual. 19 X 19" 25 13/16 X 19" 25 13/16 X 19" 25 13/16 X 19"